HARDING, Warren Gamaliel, a Senator from Ohio and 29th President of the United States; born in Blooming Grove, Morrow County, Ohio, November 2, 1865; attended the public schools and Ohio Central College at Iberia; studied law for a short time; taught school; engaged in the insurance business; became editor and publisher of the Marion Star in 1884; member, State senate 1899-1903; lieutenant governor of Ohio 1904-1905; unsuccessful Republican candidate for Governor in 1910; elected as a Republican to the United States Senate and served from March 4, 1915, until his resignation, effective January 13, 1921, having been elected President; chairman, Committee on the Philippines (Sixty-sixth Congress); elected President of the United States on the Republican ticket, was inaugurated March 4, 1921, and served until his death in San Francisco, Calif., while on a tour of the Western States and Alaska, August 2, 1923; lay in state in the Rotunda of the U.S. Capitol, August 8, 1923; interment in Marion Cemetery, Marion, Ohio; reinterment in Harding Memorial Tomb. American National Biography; Dictionary of American Biography; Downes, Randolph. 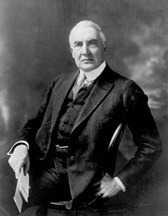 The Rise of Warren Gamaliel Harding: 1865-1920. Columbus: Ohio State University Press, 1970; Dean, John W. Warren G. Harding. New York: Times Books, 2004.